“I’m a forty-nine year old married man. I’m the father of four kids, three of them still live at home. In the past I had a business as a carpenter, I focused mainly on the interior finishing of houses. Me and some associates did the interiors while my wife looked after the sales in the showroom. She also led everything in good order. The little bit of free time I had I spend on fishing alone or with the kids. Also one of my favourite hobby’s was long distance running. Have you been born with your disability? No, three years ago I was the victim of a car crash. Because of the crash I’m fully paralysed of the four limbs. Also known as C4 and C5. I have no more feeling in my hands or the other parts of my body. Only on my shoulders and face I feel a little. Also my muscle power in my shoulders en biceps are just enough to make my arms slide over a table or to put them five centimetres above the table. I haven’t got a wrist movement or a grab movement anymore. How was the period after the accident? What can I say? Your whole world starts to collapse, there are so many questions, so many uncertainties. The one thing you never imagined happening to you, does happen. It took a little while before I could give everything a place, but together with my wife I made the decision to make the best of it. And that works quite well if you haven’t got to take care of many problems on your one. The social net that is supposed to take care of you has some serious gaps. It all takes too long, and I haven’t spoken about the paper work yet. This is a full time job and it works discouraging. Luckily we persevered but now three years after the accident the end still isn’t near. When and how did you learn about the Armon arm support? During my revalidation I was confronted with the regular Belgium ways of arm support. These were medieval, it used a system of ropes and weights. Okay during a revalidation, but certainly not for the daily life. A visit at the Reva beurs (big fair for assistive equipment and technology in Flanders) also didn’t bring any solutions. My wife is than beginning to search on the internet and she found the Armon. After a first fitting at the revalidation centre, where I saw the possibilities of eating by myself again and so much more, I said to myself “this is it”. While the Armon was mounted on my wheelchair we tested it for a period. This opened a whole new world for me, with lots of possibilities. Can you describe us the importance the Armon Ayura has for you? What difference does it make for you? The Ayura’s have given me the feeling of a bigger freedom. I can now decide without needing someone else when I will do some kind of action. There hasn’t have to be someone with me all the time. My arms are even moving during a conversation without me noticing it. The Ayura’s have become a part of me. When I haven’t got them on I try to move my arms but this doesn’t work well. For me it means the difference between living like a plant or as a human being. If you know there is the opportunity to move your arms or not, what choice would you make? I hear the Armon Ayura is about € 15.000 per arm. You have one for each arm and there is no reimbursement for it in Belgium … Did you win the lottery? No, I have got the “luck” that there was a third party responsible for my car crash. Because of this I wasn’t depending on the official, government agencies. Those didn’t even knew of the existence of some kind of arm support and they weren’t very interested neither. Luckily after two years and a couple of months I could convince the insurance company, with the necessary motivation, movies and conversations, that the Armon wasn’t a luxury for me. Finally they agreed to give me the Armon’s for both of my arms. An arm support system like the Ayura indeed costs a lot of money but it pays itself back, because I’m a lot more independent what comes down to less help and assistance of other persons. How do you feel about it that other people like you can’t use this necessary aid because it isn’t on the government’s reimbursement list? It makes me angry and frustrated. The medical world does so much to keep you alive and when you have given everything a place and when you have found the courage to go on, then bureaucracy pops his head above water. Questions like “Why do you want your arm back?” and “Why do you need a second one?” aren’t an exception. The bureaucracy is based on tables, averages and schedules although they should know that two man with the same injury can have very different needs. The same rights for everyone …. sometimes that’s far away. Most of the time I feel ashamed and don’t want to use my Armon’s in the presence of a person with the same disability. Because why do I have these supports and they don’t? It’s so unfair. What can we, as disabled persons, do to make the Armon more available for everyone who needs it? We have to put the concerns of an independent life and being able to do things by ourselves more in the spotlights. The Ayura is a perfect example for this. We have to focus the attention of doctors, therapists, hospitals, communities and government agencies on these supports. Persons, who need an arm support system, should be introduced to it. So they can used it to. You can certainly count on my help! Thank you very much for the interview Eric! 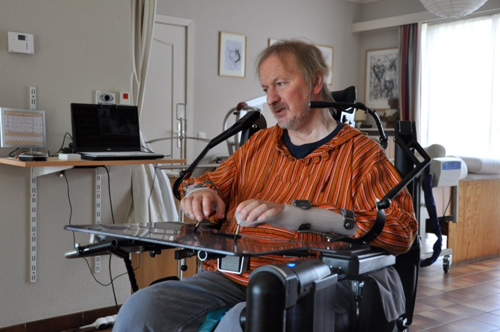 European Network of Independent Living, ENIL, believes that people with a disability should have the right to use every helping aid,adaptation or assistive technology they choose to lead an independent life. We are the experts who know best what exactly we need. In reality we are often confronted with social workers or government functionaries who decide for us. They will pay us back certain wheelchairs, but maybe not the one that suits you the best. Same story for respirators, personal lifts, hearing devices, … Especially when you need more expensive technology it is often impossible to get it reimbursed. How effective it is for your independence and your quality of live seems to be less important than the price.